Waterford footballer and Hall of Fame inductee, Marie Crotty. MARIE CROTTY’S ILLUSTRIOUS career will be honoured this weekend, as the first woman to ever score a point in Croke Park will be inducted into the LGFA Hall of Fame. The Waterford native will be recognised at the TG4 All-Star awards banquet on Saturday night, cementing her place as one of the greatest to ever play the game. 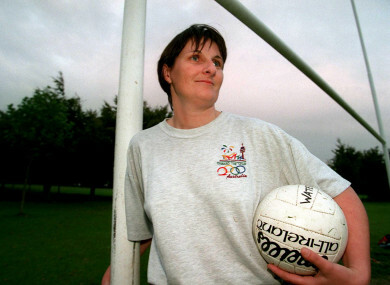 As part of her local club, Ballymacarby, Crotty won 10 All Ireland senior championship medals – seven of which were won consecutively – as well as 14 Munster titles. On the inter-county scene, she claimed five All-Ireland senior medals, eight Munster championship medals and five All-Star awards. In 1986, she made history by becoming the first woman to score a point at Croke Park – the first on the scoreboard during that year’s All-Ireland final against Wexford. “It’s a massive honour, to get an award for something you love being part of,” she said. Another former Waterford star, Catriona Casey, is a former team-mate of Crotty and will be there on the night also. Casey was the first woman to score a goal in Croke Park. The four provincial Young Players of the Year will also receive their awards – Chellene Trill [Galway and Connacht], Aoife Rattigan [Kildare and Leinster], Síofra O’Shea [Kerry and Munster] and Megan Ryan [Donegal and Ulster] – on Saturday night. The 2018 TG4 All-Star team will also be revealed, along with the TG4 senior, intermediate and junior Players’ Player of the Year award winners. Email “First woman to ever score a point in Croke Park to be inducted into LGFA Hall of Fame”. Feedback on “First woman to ever score a point in Croke Park to be inducted into LGFA Hall of Fame”.